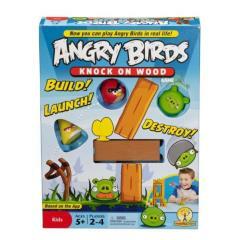 Angry Birds Knock On Wood Game Build, launch and destroy with an exciting skill-and-action game based on the best-selling phone app. 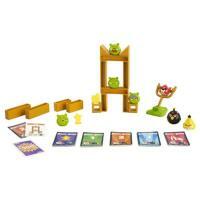 Game features three Angry Birds, green pigs, one slingshot-style launcher, structure pieces and mission cards. Players draw a card and build the structure shown before their opponents launch an Angry Bird in an attempt to knock it—and the pigs—down to win points.